Step back into the thirteenth century, a time when the nobles of Europe lived in great stone castles that had tall towers and strong, protective walls. Let’s visit one of these castles where preparations are being made for a sumptuous feast. The head cook and under-cooks are bustling about the hot kitchen. Many courses will be served and there is much to do. Some servants are slicing fruits that will be cooked in wine. Others are plucking feathers from blackbirds, swans, and a peacock. Bread, fish, and meat pies are baking in the ovens. In the large open fireplace, the carcass of a wild boar is roasting on a spit, turned by a boy. Next to it, bubbling cauldrons filled with stews hang from chains over the fire. Pungent smells of garlic, onions, herbs, and spices fill the air. In the castle’s great hall, long tables and benches are being set up. At one end of this room is arable that is elevated on a platform. This table, called the high table, is where the lord of the castle, his family, and the most honored guests will sit. Cups, plates, bowls, and spoons are placed on the tables. The diners will bring their own knives. At 10:30 A.M. A trumpet signals that the feast is about to begin. The guests, attired in their best clothes, wash their hands with perfumed water and then listen to a blessing. Breakfast was at sunup, so everyone is ravenous. A parade of servants carries dishes into the hall from the kitchen. One of the most amazing of these is the roasted peacock. Its head, tail, and the rest of its colorful feathers have all been reattached. The carver cuts up the roasted meats and gives the best pieces to the diners at the high table. The cupbearer stands by to make sure that empty cups are quickly replenished with wine. Servers pass platters that are heaped high with food and ladle stew into bowls that are shared by each pair of guests. 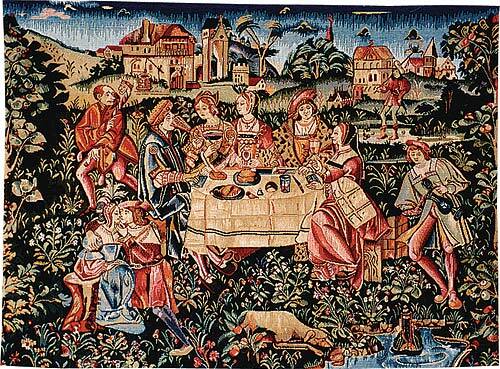 Since forks were rare in medieval times, the diners use their fingers to fish out tasty morsels of meat from the stews. More and more courses are brought into the hall. The sweet dishes include fruit pies, a pudding with rose petals, and something called a subtlety. The subtlety, made with sugar and almond paste, has been molded to look just like the castle. By the end of the feast, the lord and his guests have consumed great quantities of food. Many feel just as stuffed as we often do at the end of very big Thanksgiving dinner. Think of the biggest meal you’ve ever eaten. It’s likely that Sonya Thomas has eaten a lot more than that. The petite woman weighs only about 100 pounds, yet she has smashed national and international records in competitive eating. Competitive eating events are contests to see who can eat the most of a certain kind of food in a set amount of time. When it comes to this competition, dainty diners need not apply. Have you ever eaten lobster? Sonya can eat 44 of them in 12 minutes. How about french fries covered in chili and cheese? Sonya once ate more than 8 pounds of them in 10 minutes. Sonya has eaten 65 hard-boiled eggs in 6 minutes and 40 seconds. That’s about half the time it takes to cook a single egg! You might eat a slice of cheesecake for dessert. Sonya once consumed 11 pounds of this rich dessert in just 9 minutes. Sonya stays in shape by eating lots of fruits and vegetables and by avoiding junk food, except in competitions. She also exercises regularly. These habits not only help keep Sonya Thomas healthy but allow her to perform better in competitions. ​A Fruit? A Vegetable? Which Is It? What’s the difference between a fruit and a vegetable? The differences are not as straightforward as you may think. The way you categorize these foods may depend on whether you’re a scientist or a chef. For example, most people think of fruits as sweet and vegetables as bitter, bland, or savory. So what would you call a tomato? Tomatoes are often added to foods such as pasta sauce, tacos, and stews, so most of us think of them as vegetables. However, a tomato is really a fruit. What about cucumbers and peas? They’re green like many vegetables, and we eat them as side dishes, not on ice cream or cereal! But they’re actually fruits, too. So are squash, beans, and nuts. Botanists, or scientists who study plants, define a fruit as any plant part that can generate a new plant or the seeds of the parent plant. A fruit is formed from the flower of a plant. Vegetables, on the other hand, are all the other edible parts of a plant—the roots, the stalks, the leaves, and so on. Carrots and beets and potatoes are root vegetables; celery and asparagus are stalks; and leafy vegetables include lettuce, kale, and spinach. 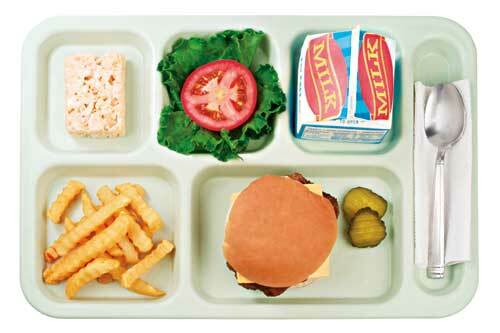 Of course, when we’re eating, we don’t worry so much about whether our food is a fruit or a vegetable. We mainly focus on flavor, but the debate over fruits and vegetables can get heated. In a famous court case (Nix vs. Hedden) in 1893, the U.S. Supreme Court decided that it is correct for people to call a tomato a vegetable, even though, scientifically speaking, it is a fruit. So the next time someone tells you to eat your veggies, ask if they really mean fruits instead. 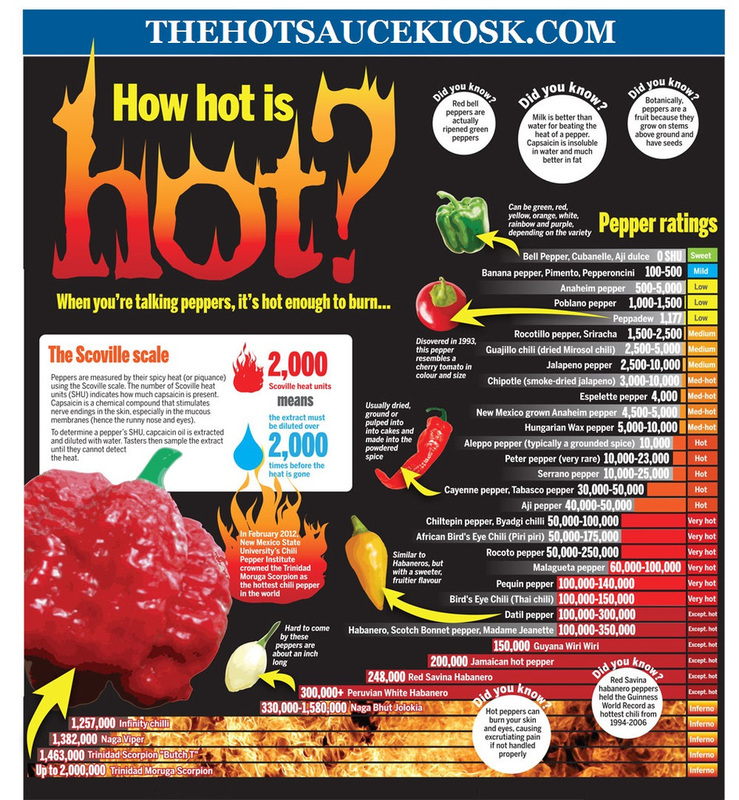 ​If you love hot, spicy foods, you probably love hot peppers! The spiciness in peppers is determined by special chemicals. If a pepper has a lot of these chemicals, it will be hot. 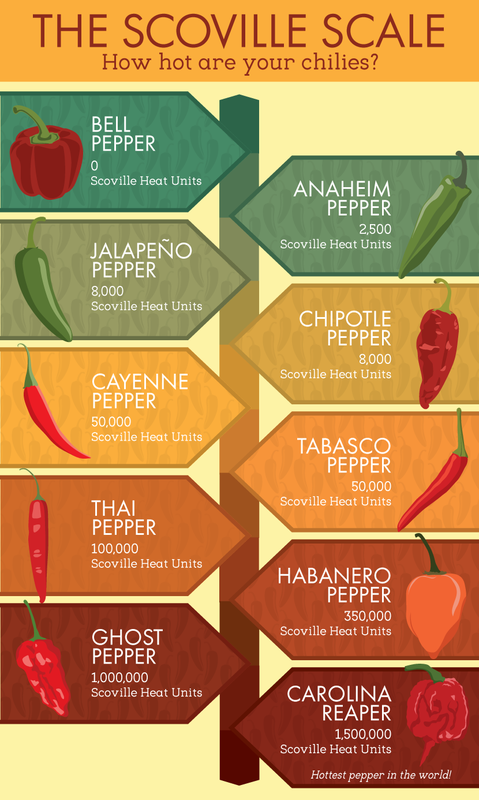 The heat in peppers is measured using the Scoville scale, which is named after the man who invented it, Wilbur Scoville. Bell peppers are at the bottom of the scale because they don’t have much of the chemical that makes peppers hot. Pepperoncini (pep-ur-ohn-CHEE-nee), which usually are pickled, are somewhat hotter than bell peppers. Spicier still are Anaheim and poblano peppers, which are good for mild sauces or for roasting and stuffing with cheese. Then there’s the famous jalapeño pepper, found in spicy dishes worldwide. With a Scoville heat unit (SHU) rating of 2,500 to 8,000, this little green pepper makes salsas sing with flavor. Many peppers are hotter than the jalapeño, but not many mouths can tolerate peppers that have the highest Scoville ratings. Some yellow Hungarian wax peppers are nearly twice as hot as a jalapeño. Cayenne pepper, often sold in powder form, can be 10 times as hot, but even these peppers pale in comparison to the ghost chili pepper. The ghost chili pepper, which comes from India, currently holds the record as the hottest pepper in the world, with a Scoville rating of over one million. Some farmers in Africa grow these peppers around their crops to keep wild elephants out of their fields. Now that’s a powerful pepper!